Core samples from the earth are an important tool to answer questions about the world around us. They can help us figure out when in history a volcano erupted, an earthquake occurred and oceanic conditions over a targeted point in time. Cores can help us learn about the ecosystems on the deepest seafloor and they can even help us learn about climate change, historically and in the future. And now the Antarctic cores have a new home in Corvallis. The new Marine and Geology Repository is complete and ready to begin receiving these resources from their previous home in Florida. Since 1972 Oregon State University has housed the Marine and Geology Repository for the College of Earth, Ocean, and Atmospheric Sciences. The Repository houses sediment cores from lakes, sediment traps and, now, the Antarctic. The National Science Foundation awarded Oregon State University curatorial stewardship of the Antarctic core collection, previously based at Florida State University (who will continue to co-manage the samples). It was the job of the MGR to pack up and move those ice cores across the county, in the heat of the summer, to a new facility. The Marine and Geology Repository has been moved to a renovated facility on Research Way, sharing a building with OSU Printing and Mailing. The Antarctic core collection will be combined with Oregon State’s current collection in the new, 95,000 square foot facility. 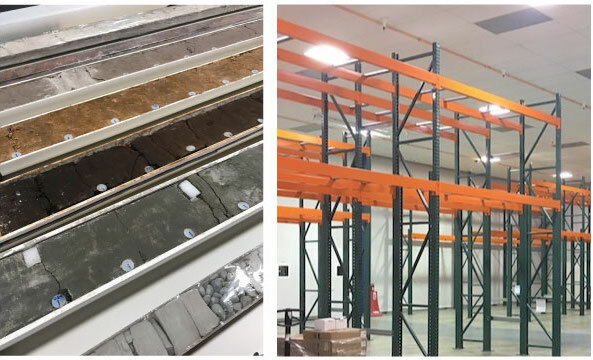 Cold storage of the cores will occupy 18,000 square feet of 37-degree space and there will be plenty of room for students and other researchers to come to learn and collaborate with the Marine and Geology Repository.